Bring the park playground right to your home with the Flexible Flyer Metal Swing Set. With five different activities keep up to nine kids busy at once, play time is endless. This sturdy swing set for the backyard or patio features a steel frame for years of outdoor fun. The vinyl-cover swing chains are adjustable, so even the smallest tots can go for a swing with the bigger kids. Perfect for outdoor birthday parties, this Fantastic Playground Swing Set has three swings and a trapeze wing, so friends can swing together. Or, they can ride the seesaw or take a ride down the slide. The Flexible Flyer Fantastic Playground Metal Swing Set gives your kids and their friends a safe place to play all day long! Wouldn't your children love this swing set? I know mine would! Stay connected with CyberBingo.com on Facebook & Twitter! 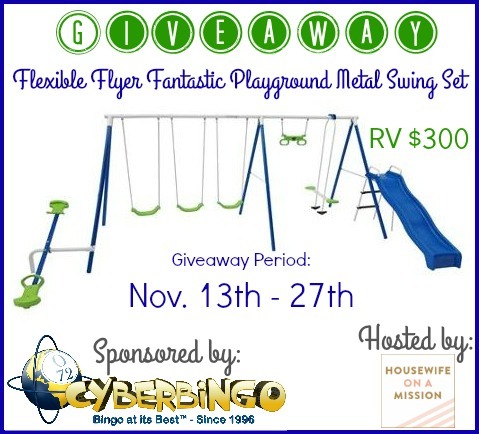 One of our readers are going to win a Flexible Flyer Fantastic Playground Metal Swing Set, courtesy of CyberBingo.com! Disclosure: Housewife on a Mission and the participating bloggers are not responsible for prize fulfillment or shipment to giveaway winner. A winner will be drawn at random then emailed and have 48 hours to respond to claim their prize. If no response is given, another winner will be chosen. Facebook, Twitter, Pinterest and any other social media are not affiliated with this giveaway.